Chuck's Chatter: Is storm chasing inherently an immoral behavior? Is storm chasing inherently an immoral behavior? Since the deaths of storm chasers during the El Reno tornado of 31 May 2013, there's been a growing concern expressed on social media about the ethical basis for storm chasing. I can understand those concerns and have expressed my own concerns on this blog several times, and in my web essays. The question is, then, is chasing inherently immoral? I wrote a lengthy essay a while back on chasing safety (see the "web essays" link above). It's been updated several times as new issues have come to light. 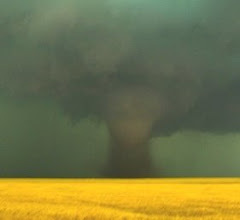 There's another excellent blog by Barb Mayes Boustead on the post-El Reno tragedy that reflects what I think responsible chasers feel about this topic. But some have the belief that even the concept of chaser responsibility is meaningless, because it's chasers who decide for themselves what responsibility means to them! Thus, in this view, chaser responsibility has no meaning because it's a relative morality. This has some similarity to the religious arguments about relative versus absolute morality. Who besides chasers should decide what chase behavior is responsible? There are no wholly objective chaser morality boards, and even if such did exist, any regulations they might impose are essentially unenforceable. In the absence of a set of god-given chasing responsibility commands, I think most chasers have a pretty clear idea of what is responsible and what isn't - I tried to articulate this in my essay on the topic. Part of the problem is that some chasers choose to flaunt their irresponsibility for all to see - a red badge of testimony to their extreme disdain for responsibility. They think of me (and other critics) as a self-righteous prude and thumb their noses at my concerns - these are storm chasing's "yahoos". And of course some chasers have different opinions about this or that component of my safety essay. The fact that such disagreement exists doesn't mean that it's not possible to define chaser responsibility in a meaningful way. I suspect if a survey of chasers were to be done, the resulting consensus wouldn't be too different from what I've listed in my essay. There might be circumstances where something mitigates the apparent irresponsibility of some act I've deemed to be of concern in that essay. Not all nighttime chasing is irresponsible, for instance. Some believe that by being on the roads, chasers are threatening the safety and efficacy of first responders and ordinary citizens - blocking the roads at a time when those roads are needed the most. This is most serious whenever major chaser convergences arise, of course. It's not so relevant for solo chasers. Often, of late, locals on "joyride" chases in their vicinity or fleeing their homes can combine with numerous chasers to create long lines of vehicles, effectively blocking the roads, so this is not an unfounded concern. I readily admit that massive chaser convergences can be a big problem, and I avoid them whenever possible. I also believe that when chasers become casualties, they're adding to the burden imposed on first responders. Resources needed to rescue an irresponsible chaser who got in close and paid the price are not available to the real victims of a devastating storm. Responsible chasers avoid such situations. Another thing that I believe concerns critics of chasing in the post-El Reno era is the sensationalization of chasing and the celebrations of chasers over their successes, even as people's lives are devastated. In fact, I've written about that here. I share the concerns of critics about chasers showing their joy in videos. At the very least, I recommend the audio portion of their glee be suppressed when their videos become public. I understand the excitement of a successful chase, but chasers should be mindful that tornadoes can result in tragedy, and be respectful of those who have been unfortunate in having their lives destroyed by tornadoes. Showing your excitement on videos shared in public media is simply not being responsible! In the same way that the atmosphere doesn't obey my wishes, so that I bear no real responsibility for what tornadoes do, it seems that chasers are under no obligation to obey my "rules" about being responsible. Widespread glamorization of chasers via the media has produced massive chaser convergences and brought in many new irresponsible chasers over the years. I know of no way to stop the process and I have no authority to do so. But is chasing inherently hostile/immoral? Not when done by responsible chasers, some of whom have made contributions to the science of storms that have led to important new understanding that can be applied to the warning and forecasting of tornadoes. Some have played roles in storm spotter training that undoubtedly have saved lives. Chasing cannot inherently be hostile. It becomes immoral only when the actions of irresponsible chasers lead, directly or indirectly, to harm to our society. Let me illustrate this with an example: many have seen the infamous "Turnpike" video from the 26 April 1991 event in Kansas. That video showed people sheltering under an overpass as a tornado supposedly went right over them - their survival was implicitly advocating the use of overpasses as shelters. The TV news team members were storm chasing, not accidentally caught and seeking to escape the danger, and their award-winning (!) video led to 3 fatalities under overpasses in the 03 May 1999 event in Oklahoma, as some of us had predicted eventually would happen. No doubt the news team was unaware of the consequences of their video. But it had unfortunate consequences, nonetheless, that were predictable. How many people already have died in tornadoes with video cameras or cell phone cameras in their hands? No one knows. There may be many more of these about which we have little or no information - it may have happened in Tuscaloosa on 27 April 2011, two years before the El Reno chaser deaths. Is this another unintended consequence of chasing? Probably so - especially the sensationalization of tornado chasing that has become so pervasive in the media. The competition to get the wildest, near-death experience recorded and broadcast has begun and clearly will result in more chaser fatalities. And, likely, more irresponsible chasers.